Successfully Added IR Wireless Earphones with USB + Mic to your Shopping Cart. IR headphones - Restrictive wires are now a thing of the past. 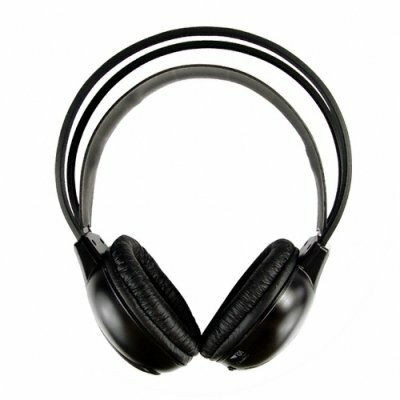 The comfortable headphones are able to be used with a PC (no drivers needed for Windows) - great for MSN Messenger, Yahoo! messenger and Skype or simply singing along with your favorite songs while recording your voice on the computer. With the included power adapter the sender can be used in the lounge to send audio from your AV setup (i.e. DVD player) or for listening to your MP3 player. The IR sender/ Microphone can also be used to charge the batteries of the headphones (rechargeable AAA batteries required). If the headphone batteries run flat you can even use the included 3.5mm audio cable to run the headphones in "wired mode". An incredibly versatile product available direct to you from China at a low wholesale price. I purchased these to see if they would work with the Headreast DVD player YP7QD6L9EVS8. Not only are the earphones great but they work perfectly with the DVD player. I wouldnt get one without the other.